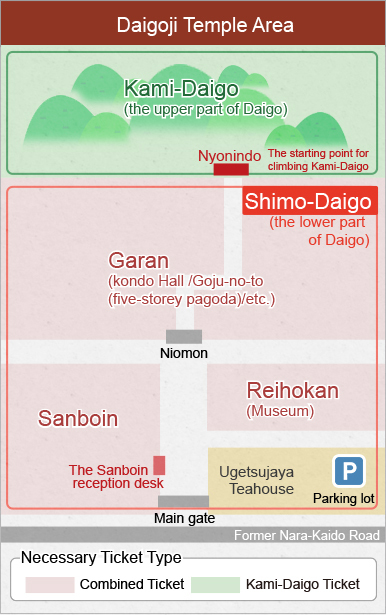 *The area surrounding Daigoji has limited parking and the roads are narrow, so please use public transportation if possible, especially on Saturdays and Sundays. Combined Ticket for Sanboin, Reihokan and Garan. *Follow the guidelines posted on the mountain paths. *Please descend to the foot of the mountain by 17:00. *If you cannot gain admission at the reception desk at Nyonindo, please go to the reception desk at the office in Kami-Daigo. *Please note that access to the mountain may not be granted due to bad weather conditions. Combined Ticket holders pay 500 yen. Senior High/Junior High School Students 400 yen. Combined Ticket holders pay 300 yen. ・KINKI NIPPON TOURIST CO., LTD／NIPPON TRAVEL AGENCY CO., LTD／MEITETSU WORLD TRAVEL INC.／TOBU TOP TOURS CO.,LTD.／Japan Railway Company(JR)／JTB Corp.／Club Tourism International Inc.
*Parking available for up to 5 hours for the prices listed above. *After 5 hours, regular vehicles will be charged an additional 100 yen every 30 minutes; oversized vehicles will be charged an additional 300 yen every 30 minutes.